Sealing colored concrete will not only protect it from stains and weather exposure, it will also enhance the beauty of the concrete by bringing out the color. Do you want a clear sealer? Do you want to use a tinted sealer that matches the color of the existing colored concrete and makes the colors more vibrant? Is the sealer compatible with the type of coloring system used? Each sealer manufacturer or supplier has recommendations for how to maintain their product. It is strongly suggested you follow their recommendations for the type of coloring system you have since the color manufacturer has been dealing with installations, servicing, and maintenance issues with their products for many years-they know what works. Your contractor will be able to tell you the specific brand of color you have if you don't know. 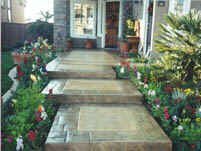 This link provides a list of concrete sealer manufacturers. Cleaning and sealing your colored concrete should be done on a regular basis, just like any other home maintenance. The frequency will depend on how much vehicle and foot traffic the pavement receives and the exposure conditions to weather and chemicals. The benefit of diligent maintenance will be beautiful colored concrete that looks good for years after it was installed.